I'm not a huge fan of exercise. Well, at least exercise that involves a lot of sweating, heart racing, and people watching me. Let's just say that running is my least favorite activity. But before getting pregnant, I was doing Zumba classes which are about the only kind of sweating, heart racing, and social exercise I can do. Even though I felt a little ridiculous doing hip moves and salsa steps, I wasn't the only awkward one in the room so I didn't feel so bad. Well, then I got pregnant. Yes, I know I could have continued going to classes, but I struggled through them without being pregnant plus the times of the classes started to conflict with other life activities. So, what's a girl to do who's not a huge fan of exercise but still wants to stay active during her pregnancy and beyond? Well, I walk. I do yoga. 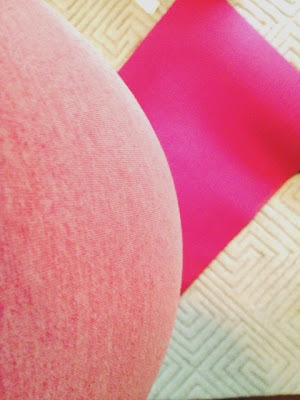 And I recently started doing prenatal pilates. Basically, I've been doing low impact exercises that focus more on breathing and stretching than heart pumping moves and sweating. But, during these last few weeks, I have felt more and more...well, large...and less excited about exercising. At the same time, I know that as long as I can keep moving I should keep my hips swinging. Hopefully, it will help with a smoother labor and faster recovery--hopefully! So, when I heard of the prenatal pilates program called Balance Beginnings that Robin Long created, I really wanted to give it a try. I also knew that trying it out would help me stay accountable to keeping my body active during the home stretch. Plus, I'm a fan of exercise that gives me a boost of energy, helps my body + mind prepare for the "big day," and is manageable (as opposed to making me feel like I'm going to fall over and die). So far, I've completed almost all of Robin's videos (there are 5 main videos), read through the extra resources, and listened to the relaxation prompt. 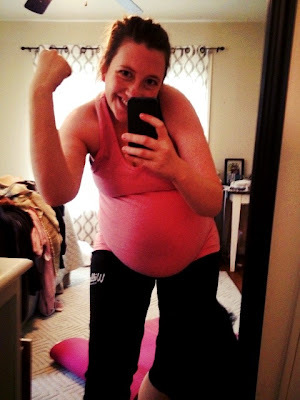 --Even with an almost 38 week old pregnancy belly, I was able to do almost all the moves (some I needed to modify just a bit). --I like how there are videos of different lengths so that I can choose my time + energy commitment based on how I feel or what I want to accomplish. I'm excited to do another week of the program! I only wish that I would have had access to it earlier on in my pregnancy :) I totally recommend this prenatal exercise program to anyone who wants to stay fit during pregnancy as well as have some accountability to do it. So, if you are pregnant or know someone who is, Balance Beginnings would be such a helpful resource to check out!